In this blog post, I will advise you which router, switch and access point you should buy. How you connect everything and give you some tips on setting up your home network, so you have the best home network for your money. If you have any question, just let me know. 3.1 How many ports do you need? Before we start buying the network gear, first figure out what we need and what we want to accomplish with our home network. What is the layout of your home and where do you want to have internet? Just inside or do you also want to use the WiFi in your garden? Wired or Wireless? Most devices can connect over WiFi, but for streaming and gaming, a wired connection is better. Do we need to access the company network over VPN? How many devices do we need to connect wired? Do you want to support PoE (Power of Ethernet) devices? Think of IP Cameras and Access Points. So taking these points into consideration, we need to plan for a network setup that is suitable for now and the upcoming 3 to 5 years. More and more devices require an internet connection these days (IoT), most wireless, so good wireless coverage is important. Especially if you want to use Smart Home products, like the Philips Hue lights. They require a wireless connection. Also, keep in consideration that kids grow up, get there own mobile phone and might have a computer or game console in their own room. The first thing we need is a good network router. Your ISP will provide you with a modem/router which sometimes also has a built-in access point. So you might think, why not use just the default modem/router? Well, you have no control over security, the features are limited and the WiFi coverage is terrible. Besides that, the modem/router from the ISP needs to be placed close to the internet cable, which is in most cases not place where you want to use the wireless network. What are we looking for in a router is a device that is easy to manage, fast (amount of packages per second), supports QoS (quality of service) and fanless (fans make noise and attracted dust into the device). What I don’t care about it there WiFi performance. A router is never placed in the optimal position for good WiFi coverage. And good WiFi coverage and speed is the most important part of a good home network. So you really shouldn’t save money on buying a good access point. I am a huge fan of the Unifi product line for home and small business networks. The Unifi line uses a web-based controller which you can run on your computer or with a cloud key. You can use one controller to manage all your Unifi devices, get a clear overview of your network performance and connected clients. The performance of the devices is enterprise-grade, the prices really good. They support all the must-have features, like QoS, Advanced Firewall, VLAN support and VPN. You can get and Unifi USG on Amazon for around $ 120. If online gaming or video conferencing is important for you (or your household), then go for the Ubiquiti EdgeRouter X. The EdgeRouter X is capable of handling 100 to 250mbit internet connections with QoS enabled. The USG can only handle a 60mbit internet connection with QoS. Another advantage of the ERX is that costs only around the $ 50. I have written a detailed guide on how to install and set up the EdgeRouter X and optimize it for the best performance. Netgear has always done a decent job on networking. Their products are reliable, the web interface is ok, not centrally managed though and the pricing really low (only $ 70,- on Amazon). What also I great about the N900 is that it comes with parenting controls, to filter the web traffic and is supports a guest network. The N900 has VPN support is compatible with Time Machine and a great feature is the USB storage access. This way you can connect your USB hard drive to access it from your network (or smart tv for example). One of the best Netgear routers out there, spend the few extra bugs and buy at least the AC1900 which has dynamic QoS. QoS prioritizes network traffic, for example, Streaming, Video Conference traffic is more important than download traffic. So this is given a higher priority and is handled first over the network. Wait, what, is that title correct? We are in the router part here… Yes, I know, but this is something different, something new. And as a tech guy, I like new. Google created a Router replacement set, it uses multiple Wifi Systems that takes care of the routing and Wifi Coverage. Don’t make the mistake of just buying one of these, that just won’t work. To make full advantage of this technology, buy at least two or three to create a mesh network in your house. Because of the nice design, you can place these in view everywhere in your house. Connecting network devices by wire are the best solution if you want stability and performance. Wireless networks are prone to interference which can be really frustrating when you are watching your favourite series on Netflix or competing in an online game. So when you have the opportunity, pull cables to every location in your house to ensure a good, reliable, home network. When I remodelled my home I pulled some extra wires to the TV and HiFi set. Yes, the Smart TV supports WiFi, but the built-in antenna is surrounded with metal which weakens the signal. And I hate it when Netflix keeps buffering, so if you have the chance, get an ethernet cable between your TV and router. PoE support, this way you can connect an access point with only an ethernet cable. vLAN support, you want to separate your guest network for your own. To take full advantage of the Unifi products, we will go with a Unifi Switch with PoE. The PoE allows us to connect the Unifi Access Points with only an ethernet cable, eliminating the need for a PoE adapter. The Unifi line is again enterprise grade hardware for a good price. Combining all the Unifi products will allow us to manage our home network with just one controller. It will make your life and network a lot easier. They Unifi Switch will cost you around the $ 110,- on Amazon, but that is money well spent. If you need more then 8 ports, I suggest you go for two Unifi switches, an US-8-60w and a normal US-8. The 16 and 24 ports Unifi’s have built-in fans which can make some noise. The 8 ports are fanless. Netgear has a lot of switch models, plastic housing, metal, managed, non-managed, big, small, grey, blue… But what we want is a managed switch, 8 to 16 ports and gigabit ethernet. The ProSafe series is the best choice for home and small business. They can be wall mounted really nicely, have a lifetime warranty and all the essential networking features. The ProSafe is a little bit more expensive compared to the Unifi, but it comes with more ports, so you only need one of it. Check the price on Amazon if you are interested. So these are my two goto switches, I have used them both many times and they never let me down. For every business or home network setup, I just use one brand for the access points, Ubiquiti Unifi. Why? Because they are so easy to manage and have such a great performance that they are the best value for money in my opinion. 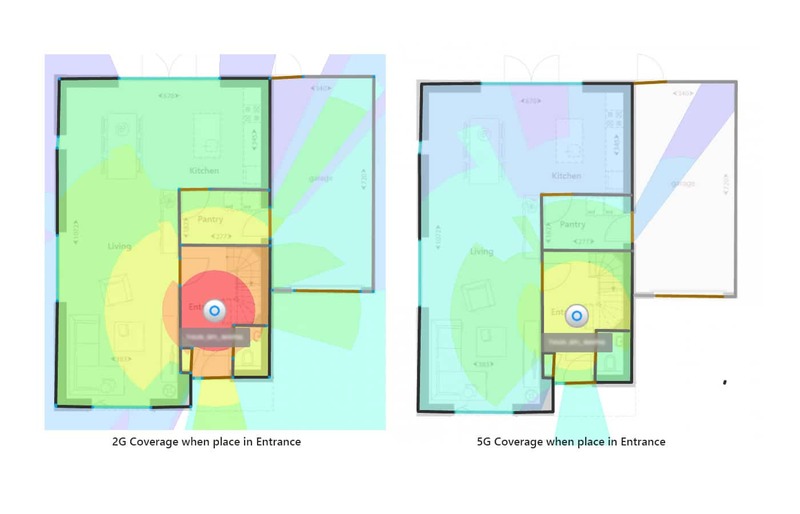 So to get the best wireless network, we need to understand the layout and structure of our house and identify the places where the most Wireless devices are. Yes, you can place an access point in the hallway, but if there is a concrete wall between the hall and the living room, then your wireless signal will suffer from the concrete and rebar. Unifi has multiple access points, you can read more in this article on choosing the right access point for your home network and installing the access points. If you go for the all Unifi solution, make sure you check out the Unifi Product bundles on Amazon to save some money. As you can see we have a modem that we got from our ISP, the Router (USG in this case), a switch, multiple access points and a cloud key. I always give network devices a fixed IP-address and use DHCP only for the clients. This way you know how and where to reach your network equipment when something is not working. Most ISP’s combine a modem and router into one device. This way you can just plug in your computer and it all works. But we want the best home network setup possible, so we need to “disable” the router function of the ISP’s modem/router. What you will have to keep in mind is that every router you buy has a fixed Ip-address already set from the factory and 9 out of 10 times it is 192.168.1.1 and that’s a problem. And because we are logged into our router, we might just disable the wifi so we don’t have to come back later. Find the Wireless settings page and disable the WiFi so it won’t interfere with our new access point. old router-> new router/usg[wan1] + new router/usg[lan1]->computer. In case of a Unifi USG router, you now need to connect the Cloud Key to set up the controller. This way you can adapt all the network devices. I won’t go into detail about this now. This one is pretty easy, just put a cable between a LAN port of your new router and the switch. If you have a managed switch, then check the documentation on how to login into the web interface. Some switches come with a fixed IP address, others have a tool to find the device. What I often use in for me strange networks, is a small program called Advanced Ip Scanner. This small, free tool, scans your network and list all connected devices and their IP-Address. When you are logged into to switch, give it a fixed IP address, so you don’t have to search for it again. Depending on the access point you got and the switch that you’ve bought, it can be as simple a connecting an ethernet cable between the switch and access point. But when you have a switch without PoE, then you need to place the PoE adapter between the switch and access point. The placement of the access point is really important, placing it in the right location makes all the difference in a good wifi connection or not. In the Unifi Controller is an option the create a floorplan with your devices placet on it. 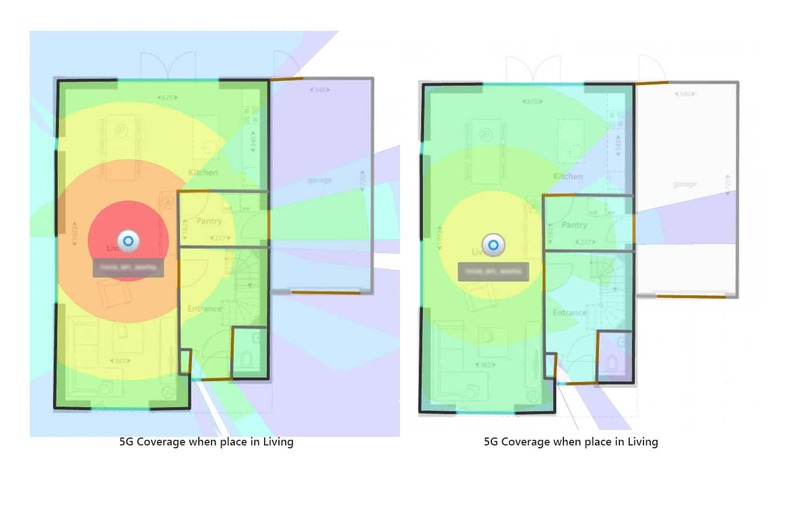 You can use this map to find the perfect location for your access points. The map allows you to draw a different type of walls, each with their own characteristics. Next, you can place your access point on it and turn on the heat map. You will see how much of the signal is blocked by the walls, doors and windows, so you get a good idea what the perfect location is. I made a few examples to give you an idea. In the first floor plan, the access point is placed at the entrance. It’s typically used location because people don’t like the few of an access point on the ceiling of there living room. As you can see, the 5G coverage in the living room is poor, the slower 2G coverage is ok. When you place the access point in the living room, where most of the wireless devices are, you will get a good connection with great performance. So I really suggest that you first draw up your floorplan in the controller, so you can find the best location for the access point. After we have done our home network setup it’s time to think about the security of it and the devices on it. We all get guests in our house, it can be friends, family or relatives and they all have a cell phone. You might be tempted to give them your WiFi password, but what if their device has malware or a virus on it? Your network could be infected as well. Most modern access points allow you to create multiple SSID’s (WiFI networks), so create one for your guests. But that’s not all you have to do, the goal is to separate the guest network traffic from your own network. And that’s where vLans comes in (remember what to keep in mind when looking for a new switch). Create a separate VLAN for your guest network to keep your network safe. When creating a VLAN your need to create the VLAN on the router first, and then assign the VLAN to the guest SSID in the access point. If you have gone for the Unifi solution you can also use the Unifi Guest Network to prevent guests from accessing your local network. Read more about the guest network and guest portal in this article. To keep our home network safe, we need to prevent malware and other malicious traffic. This can be done with a free service called OpenDNS. When you browse the internet, every URL you type is converted to an IP address. So when you type www.google.com, it’s converted by a DNS server to the correct IP address (for example 172.217.19.196 ). This conversion is done by DNS servers, and there are many DNS server available. Your ISP has one, Google, Microsoft etc. OpenDNS is free for personal use and I really recommend using it. All it takes is changing the DNS servers in your new router to their DNS server to protect your network. New routers and access points come with a default WiFi network name (SSID) and password. You should always change this immediately after your connected everything. Hackers can easily guess the password based on the manufacturer of the router or access point. Choose an SSID name that doesn’t give away any personal information like your family name or address. All network appliances, router, access point, switch, smart devices, printers, need to be updated regularly to keep them secure. Creating a good home network isn’t a one-time task, you need to keep it updated. The firmware updates can address security vulnerabilities and improve your network device’s performance. So every two months or so, check for the latest updates and apply them to the devices. If you are using the Unifi network gear, then you can check it easily for all the devices from the controller. I hope you found this guide useful, if you have any question or suggestions, please let know. Designing your Smart Home. With a good home network as a base, you can start making your house smart! Free network monitoring tools. To see how your network performs, install a PRTG Trial go get some insights into your network. Best home automation ideas. Let your home make your life a little easier. thanks for all that info, i’m an IT student planing to do Sysadmin, i’ve been following your blog and find it very helpfull. Just wanted to encourage you to keep up with the good work. Great to hear that you found my blog useful! If you have any questions, just reach out. I’m guessing the servers go to 10GBe on EdgeSwitch 16 XG, then SFP+ to EdgeRouter RJ45. SFP from EdgeRouter to EdgeSwitch Lite SFP. Where does the NF18ACV gateway connect to? Yes, the server connects to the 10Gbe on the EdgeSwitch using the RJ45 ports on the switch. This way you don’t have to buy expensive transceivers. Now assuming you are using two uplinks per server can connect the Edgerouter of SFP with a normal SFP cable. This way you will have a 1Gbe link between the EdgeSwitch and the EdgeRouter. The EdgeSwitch Lite also has SFP ports, so you can connect this switch to the Edgerouter as well with the SFP ports. Your gateway is connected to the EdgeRouter with a normal cat6 cable using the RJ45 ports on the ERPro-8. Thank you so much for your clear advice! Very helpful. > An additional question: Do you have any recommendations for a 24 port patch panel CAT6 in the above setup (April 13 message) and the CAT6 type of cable to use? As it will be mainly cables going through walls and ending up in wall sockets, a solid core is recommended. But which type of shielding is recommended and which shielding type in the patch panel goes with that? All cables go through the same entry point as the power lines in the house (meterkast) and are laid alongside (not the same tubes) power lines in the concrete walls. Shielded seems to be a logical option. Also to avoid interference due to electrical systems in the meterkast. But which type and will that make the cable too thick to run two through one standard pipe? > And on the ER-8, does it make sense to use the Pro version as it has pretty much the same price as the ER-8? Many thanks and I will make sure to use your Amazon referral links to buy the hardware! Shielded cables are only necessary when you run the cables near powerful electric motors or near a broadcast station. You can safely wrap a Cat6 cable around a normal powerline and you won’t notice any difference. So don’t waste your money on that. About the cables, go for Monoprice cables, those cables are 23AWG and have a pure copper wire. For the patch panel, stick with Monoprice, they make good quality patch panels as well. The ER8-Pro is a little bit faster then the ER8 and has higher throughput. If you can get them for almost the same price then go for the pro. I am in the process of rebuilding my network. I currently use my ISP-provided gateway with VOIP (Netcomm Wireless NF18ACV), which runs into the router/wireless AP (Netgear D6200), which then runs into a managed switch (Netgear GS116E). I want to replace the router and switch completely. I run a media server, which will be upgraded too. I want to have a 10GBe backbone from the servers. The main media server will running the web server and media server platform, and the second server will be the media storage server. Each server will have 2-4 10GBe ports. I will be using a patch panel for the wall sockets, which will only be Cat6 1GBe. I wish to separate the server, main LAN/WLAN and guest LAN/WLAN with VLANs. I’ve chosen to use Ubiquity. Also, would it be worthwhile running a separate firewall?. What would you advise for this setup? Nice case you have here. Unifi has some switches that come with two SFP+ ports, these allow you to connect the two servers with a 10GBe over SFP+, but then you will need to buy two 10Gbe SFP+ transceivers and they are a bit expensive. It will also limit your ability to expand in the future. But if using 2 SFP+ ports is enough then the Unifi US-48 is the most budget-friendly option for the switch. Another option, if you need more 10Gbe ports, is to go for the EdgeSwitch 16 XG. This model comes with 4 10Gbe RJ45 ports and 12 SFP+ ports allowing you to expand in the future. You can use the SFP+ port to connect to switch to the Edge Router. But you will need an additional switch for your wall sockets, an Edge Switch Lite will do. You can use just one firewall/router for your network. There is no need to buy multiple firewalls. I don’t know how fast you uplink is, but if you go for the EdgeSwitch I suggest you buy an Edge Router 8 Pro, this one has two SFP ports (1gbit) so you can connect to Edge Switch with a fibre uplink. On the edge router, you can configure multiple VLANs and set up the firewall accordingly. – When going for the Edgerouter, wouldn’t a higher performing version be a better choice to benefit from a 500/500 mbit fiber connection? And which one would you then pick? – For cables, I think the most neat option is to use a patch board where I collect all the sturdy cables that go into the walls to other places in the house and then use flexible CAT-cables to connect from the patch board into the switch. Would you recommend using CAT6 or CAT6a? I would like to put two cables into each tube in the walls, so CAT6a might be to thick for that? – I am planning on using two times the Ubiquiti Light AP (bedroom/hallway) and one time the Pro (living room). Would that be a sensible option? It is a one floor appartment, but with a massive reinforced concrete wall separating livingroom from the other parts of the appartment. Yes, if you have a 500 Mbit fibre then I would go for the ER-8. How many devices need a PoE? To save money you could buy a US-24 and add a Unifi US-8-60W to it. But then you only have 4 PoE ports. Another option is to use the PoE adapters that come with most devices, but that isn’t really efficient. Otherwise, the US-24-250W is your only option. 250W is what the switch is capable of providing, it won’t use it. But it’s expensive. CAT6A is indeed too thick and you don’t need it in home networks. CAT6 can also reach 10gbit up to ~50 meters, but your clients and switches don’t support it now. In my opinion, cat6a isn’t worth the extra cost for normal use. Change the pro for the Unifi AC LR. The LR is more sensitive than the pro. I don’t know the size and layout of your apartment, but the AC Lite’s for coverage is a good choice. With regard to the Unifi US-8-60W, do you see any benefit in upgrading to the Unifi 8-Port Managed Switch with POE [150 Watt]? The 150w is around twice the price, here in Australia anyway. That would only be useful if you want to connect a lot of PoE devices to it. So it depends on the wattage of your PoE devices. A Unifi G3 Cam uses only 4 watts for example. My ISP is a fiber optic provider. I do not have an ISP provided modem/router. It is only a cable that goes from the wall directly to my router. With this, my question is, will this set up still work with the network diagram by bypassing the ISP modem? Also, would I just set up my Ubiquiti router by skipping the original IP config? Yes, this should still work, but you will need some info from your ISP. They should provide you with information on how to connect your router to the internet. Probably a PPPoE account name or static IP Address. Great article. Well thought out and informative. I am looking at the Ubiquiti website’s product descriptions for the EdgeRouterX and the Unifi Security gateway and am having trouble finding the part related to the article’s quote “The EdgeRouter X is capable of handling 100 to 250mbit internet connections with QoS enabled. The USG can only handle a 60mbit internet connection with QoS.” These both appear to be 1G capable ethernet ports. What am I missing? Is it specific to having QoS enabled? My connection has a stated rate of 400 mbps although this pc is testing at ~95 Mbps. I understand your confusion. Yes, the speed limit is related to enabling SQM. If you look in the User Guide, page 49, you will see a nice table with the speed limitation with SQM enabled. Don’t understand all this but trying to set up better wifi system than just using router and modem furnished by TV and internet providers (DishNetwork and Century Link). Only using system for TVs and computers in 3 rooms all on same floor (including streaming through Roku Ultra). Do I need “access points” and, if so, how many? You don’t discuss modems but imply that I should just use the provider’s modem. Is that good enough quality and what if I don’t want to keep paying their monthly fee? Will the Ubiquiti components work with my providers? Modems are indeed provided by your provider and most providers don’t allow using custom modems. Best is to run network cables to the computers and TVs, but if that isn’t possible then installing a good access point will improve the quality of your network. Access points provide a wireless network to your computers and mobile devices. How many you need depends on the size of your house and how it’s built. Stone or concrete walls block more signal than wooden walls. Hi Rudd, thanks for the post. I am also a fan of Ubiquiti solutions- although they may be not that easy to setup. I have Edge Max PoE supporting router and single AP in one location- works great. Anyway- my question concerns your network diagram. I am not sure what is a purpose for switch in this setup. Could you connect just directly to the usg router? Second question concerns cloud key – where exactly do you connect it? And why do you think it has no option of PoE? Lastly- would you plan for a single high range Unifi AP in a 200 sq m wooden house with single brick wall with chimney in the center or would you rather go directly for 2 AP on each level? I know I should make a heat map – but would like to know your opinion. The USG in the network diagram only has 2 LAN ports. In de diagram I only laid-out the network devices. Even with 3 devices, you will need a switch to connect them all. If you take other wired connected devices into account you have no other choice then adding a switch to your network. Edge routers typically have more LAN ports, so then you might can do without a switch. About the cloud key, it doesn’t matter where you connected it. I would go for connecting it to the switch. The cloud key gen-1only be powered with an 802.3af PoE connection. The gen-2 can be powered with PoE or with a USB C.
2 ap’s on each level for sure. Go for the Long range on the ground floor and a lite for the other level. The long range is more sensitive which will result in a better connection with mobile devices. Exactly the type of manual I’ve been looking for. Used ordered the full Unify setup and can’t wait to finally get to use my full connection speed everywhere in my house. Would you just connect these two 8-port switches separately to the internal router or daisy-chain them? Due to limitations on routing the ethernet cables in our house, I would ideally have one 8-port switch in the cellar, and a second one in a room on the upstairs floor. How would you configure such a network, assuming that is a valid plan? Ideal you connect them both to the router. Placing the two switches on different floors is no problem at all. I even recommend it, because you will need to run less length of cable, reducing the change of interference. My router is supplied by my ISP (MIDCO). At only $1/month, it is pretty affordable since I didn’t want it to have wireless. It is a CODA 45 and has a fixed address (192.168.100.1). Since I can’t change the address of the modem, how would I set up a router to not have a conflict? What type of router do you want to connect to the CODA? Your new router should have 192.168.100.254 on the WAN side (the eth port between the new router and the CODA). Your internal network will have to change to another subnet. For example 192.168.1.x . Great post. I’m toying with the idea of going with a full mesh home network for idea. Or doing it off my own back purely for the additional features which I won’t get with out of the box mesh networks. I’m currently looking at the Ubiquti range and swaying towards using their APs as well as a switch and cloud controller. What would your opinion be for a network engineer to go for? Simplistic setup with limited features, or go for a full fat network? Go for the Ubiquiti range. You don’t need to use all the features, but if you are at the point of replacing everything, then going for the Unifi setup is just a great choice. The insides that you get are really nice, they are super easy to setup and it has all the features to play with if you want. I don’t know you home layout, but for that access points, go for multiple Unifi AC’s Lite https://amzn.to/2wrQgoH access point if you have a one level house or a AC Pro https://amzn.to/2o2ium5 on the ground floor and (multiple) AC lite access point upstairs. If you have a few bucks left in you budget, then also buy the Unifi USG https://amzn.to/2MLjDfL. This is a router and firewall with great performance and allows you to control your network from start to end.